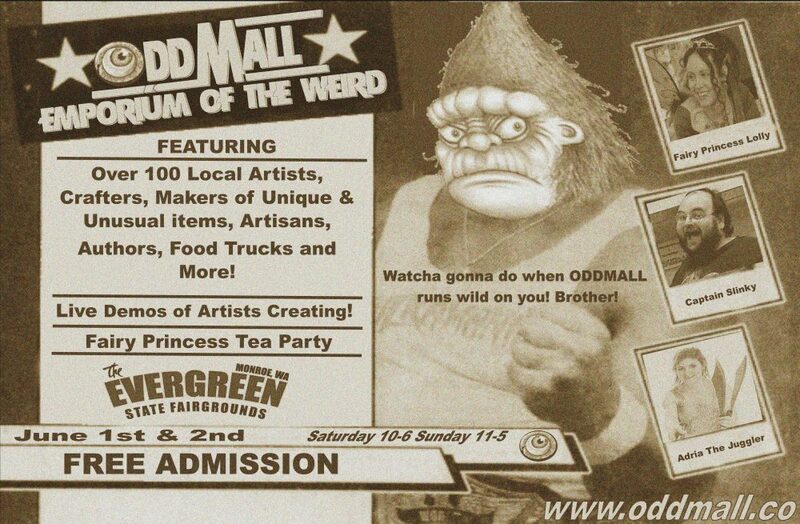 The Comcast Arena event Center will play host to one of Seattle’s most unusual and creative celebrations of arts, crafts, and culture when Oddmall: Emporium of the Weird comes to Everett for 2 days! Oddmall: Emporium of the Weird will showcase the artistic works of over 150 local artists, crafters, artisans and performers. Shoppers will enjoy the thousands of wonderfully handcrafted items and imaginative creations on display and for sale. An abundance of original artwork, jewelry, sculpture, furniture, plush animals, toys, games, clothing, and other wonders will be featured. Despite its name, not everything at Oddmall is odd. Plenty of more mundane items can be found nestled among the curiosities, but these only make the strange stuff stranger by comparison. Oddmall also hosts a number of talented performers and musical acts.